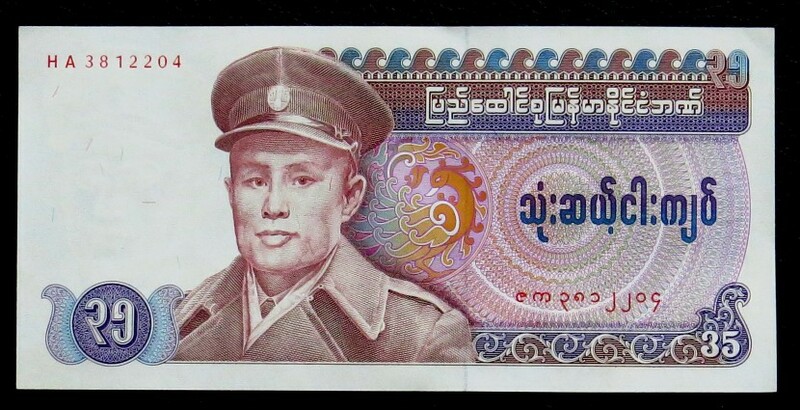 The 1986 Burmese 35 Kyat banknote features General Aung San wearing a military uniform on the front. The 35 Kyat was part of an unusual series of banknotes in the mid 1980’s that reflected Burmese socialist party leader Ne Win’s obsession with numerology. In 1989 the military took control in Burma and instituted currency reform in 1990. Long obsolete the odd denomination 1986 Burmese 35 Kyat is great currency collectible. In 1989 the country of Burma was changed to Myanmar making the mid 1980’s series banknotes the last of the Burmese money.